Taurus Hill Observatory | HAT-P-20b observed at Taurus Hill Observatory. Posted April 19th, 2011 by Harri Haukka & filed under Extrasolar Planets. 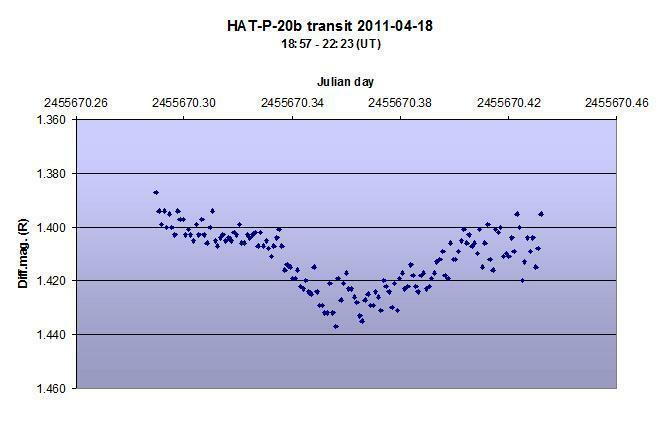 Taurus Hill Observatory research team observed and measured the transit of the HAT-P-20b 18./19.4.2011 at THO. The object is located in Gemini about 228 light years from Earth. The mother star is K type of dwarf star and exoplanet very massive, over seven times the size of Jupiter. The duration of the transit was 104.4 minutes and the dimmening of the mother star 21.5 mmag. The observation has been published in TRESCA database (CREDIT TRESCA: http://var2.astro.cz/EN/tresca/transit-detail.php?id=1303171894 ).